I found this particular device reminded me of a handheld gun that I saw in Minority Report. In the film, Tom Cruise managed to spin this weapon, Wild West Style, and it created a blast of air that was more than enough to “blow the man down”. 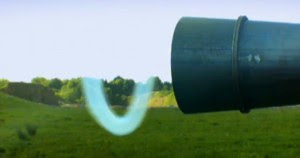 The Vortex Cannon is much heavier, but it is capable of shooting a ring-shaped cloud that is capable of traveling at 200 miles per hour. This is the “smoke ring” that you see in the picture, and is formed by the “condensation in the rapidly moving gas”. Spoiler alert! The house of bricks does tumble after being met with the high shock of the Vortex Cannon. Of course, I think there really should have been mortar in between the bricks, and it really is more of a wall of bricks than a house. Besides, it only half-way crumbles. I would imagine that the Vortex Cannon could be used as a weapon, rather than this Mythbusters-style demonstration here. I’m not certain if you would classify it as a “weapon of mass destruction”, though.